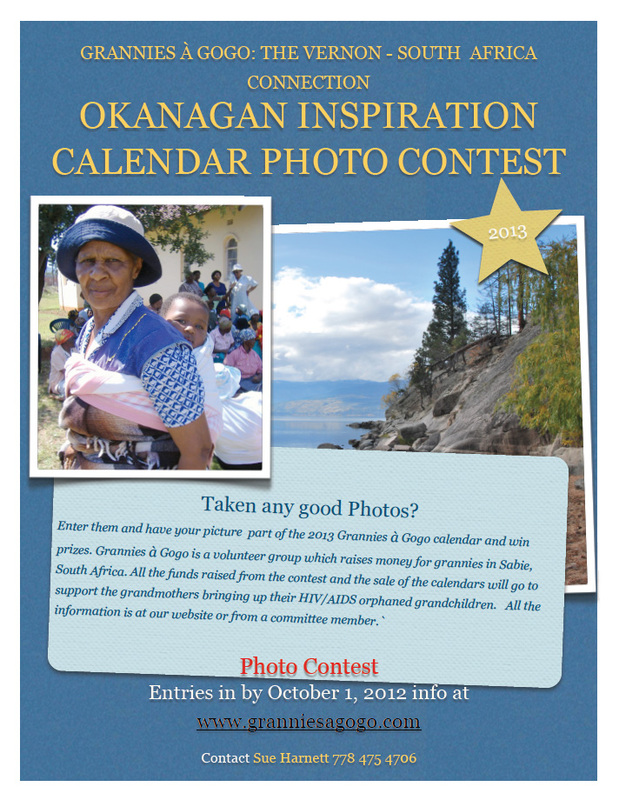 We invite you to submit your photographs to the Grannies à Gogo 2013 Calendar Photo Contest. Thirteen winning images will be selected. The contest and the sale of the calendars is a fund raiser in support of Sabie, South African grandmothers raising their HIV/AIDS-orphaned grandchildren. You may enter as many photographs as you like, but each photograph must be accompanied by a minimum $10 entry fee donation. The net proceeds from the entry donations and the sale of the Okanagan Inspiration Calendar will provide direct support to bereaved grandmothers, in Sabie, South Africa. The theme of the calendar is Okanagan Inspiration. It will be printed on high quality calendar stock, each photo measuring 8” x 10” and every month featuring plenty of room to note the events of each day. Prizes will be awarded for the top three winning photos. Submissions are due by October 1, 2012.